Sones en 3 is a project directed by traditional musician Zenen Zeferino and is based on the dialogue between son jarocho — the traditional music, dance and poetry from the state of Veracruz, Mexico — and other genres like jazz, flamenco, opera, baroque, and musica llanera, to name just a few. 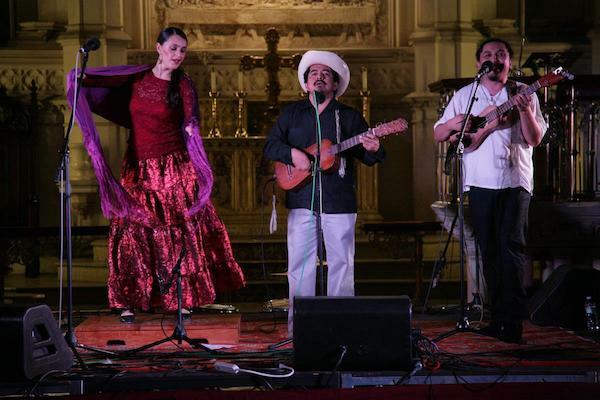 In each session, Zenen and two guests improvise and experiment, exploring the different ways in which the folk music from Veracruz can interact with the vast array of rhythms, instrumentation, and languages that are found in a city like New York. In this session of Sones en 3, expect to hear some jarocho songs from the traditional repertoire and a series of new compositions by Zenen Zeferino. Zenen Zeferino & Sones en Tres at Terraza 7 on Monday, April 3, 2017 at 8:00 pm. No Replies to "Zenen Zeferino & Sones en Tres"